Discomfort, aches and pains: not to be able to enjoy life to the fullest is a real pain – quite literally. Millions of people suffer from pain. If you are one of them, you know what it means. Chronic pain often becomes unbearable. Chronic pain is often caused by inflammation, stiffening, calcification or strain on muscles or tendons. Tennis elbow, shoulder pain, painful heel or back pain: chronic pain drains you, it affects the performance of body and mind, takes away the joy of life, and lessens the quality of life. Now there is an outpatient therapy which we offer at CCSP, which fights the causes of chronic pain – without the need for injections, medication, or surgery. 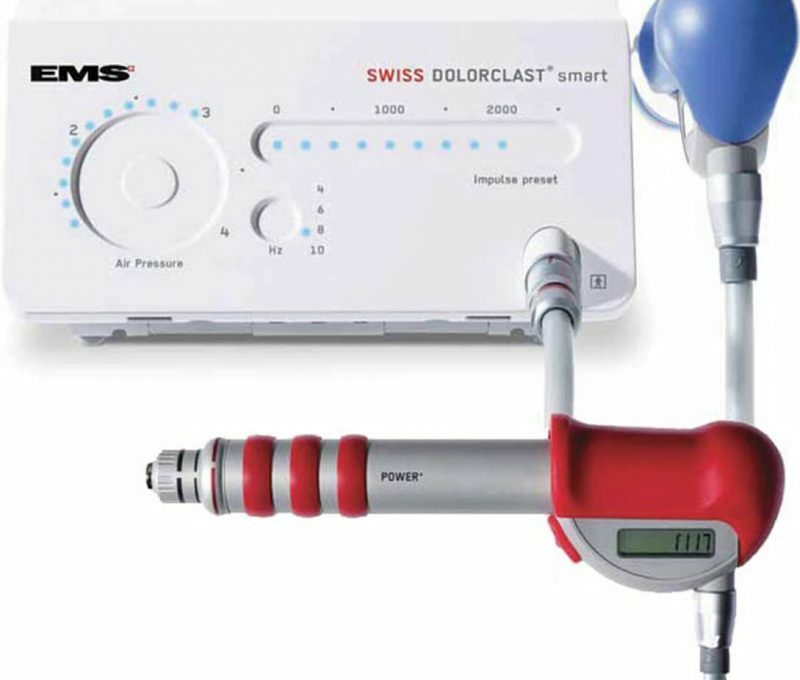 Radial Shock Wave Therapy in conjunction with the Swiss dolorclast® method is effective for all musculoskeletal problems – even if other therapies proved ineffective. Radial Shock Wave Therapy using the Swiss dolorclast® method produces high energy shock waves and delivers them to the tissue via the surface of the skin. As a result, the therapy activates self-healing processes where pain occurs. To put it simply: better blood circulation and the formation of new blood vessels results in improved metabolism. This in turn activates cell generation and helps dissolve calcium deposits. The causes of chronic pain may be eliminated even in a short period of time. Most patients find considerable relief from pain in just eight to ten days following the first application. Patient feedback allows your physiotherapist at CCSP to locate the pain by palpation or ultrasound, and then mark the area intended for Radial Shock Wave Therapy. A gel is applied to optimize the contact between shock wave applicator and treatment zone. The handpiece delivers shock waves to the pain area for just a few minutes depending on the application. As a rule, just one to three sessions at short intervals are sufficient for Radial Shock Wave Therapy to be effective in conjunction with the Swiss DolorClast® method. Each session lasts no more than a few minutes. Following the treatment, self-healing continues. Also called myogeloses, trigger points refer to fibrous areas in the muscle that are permanently shortened or thickened. What causes trigger points most often are poor body posture or improper strain. Overexertion or improper strain may adversely affect muscles as well as cartilage, bones and tendons. Painful trigger points are the result. Trigger points may cause pain in places far away from the root of the problem. Today’s Swiss DolorClast® method is particularly gentle and effective for the treatment of trigger points without the risk of nerve injury due to injection or similar procedures. Call us on 6651 9622 to book a Radial Shock Wave Therapy appointment.